The bells being removed last 20th February. And yes, it's Quasimodo's bells, or rather their successors. His bells were removed and melted down in the course of the French Revolution, and were replaced by four new ones afterwards. These bells, christened Angélique-Françoise (1915kg), Antoinette-Charlotte (1335kg), Hyacinthe-Jeanne (925kg) and Denise-David (767) have rung out from the towers of Notre-Dame ever since. The trouble is that the sound they make is not considered of high enough quality for their important location. 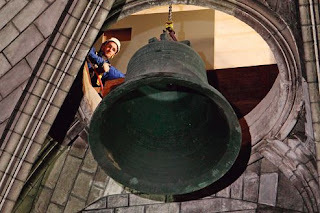 So the decision was made to replace them with some new, more euphonic, bells in time for the 850th anniversary of Notre Dame this year. Therefore, last February, the four bells were removed from the towers and sent to the bell-founders in Normandy to be melted down. The idea was to cast little model bells from them which could be sold to defray the cost of the new peal. The news of this reached the ears of the little community of Sainte-Croix de Riaumont in the Pas-de-Calais. They were shocked that this act of vandalism would be perpetrated, all the more so since they are building a new priory and are in need of bells themselves. Their prior, Fr Alain Hoquemiller, (whom I remember meeting a few times when he was studying for the priesthood at Fontgombault Abbey) has made an offer of at least 24.000 euros for the bells (he must have good sponsors!) which is generally considered to be in the right ball-park. But the Archdiocese of Paris has indignantly refused the offer and wants to proceed to the destruction of the bells. This community of Sainte-Croix is a remarkable one; following the rule of St Benedict, they have developed their own version of the life out of the strange circumstances of their foundation. They began when a priest commenced work with the disadvantaged boys of the industrial Arras region of northern France—there was much poverty and hardship, with all the usual accompanying social disorders. This priest, whose name I forget, thought that the scouting movement provided a sort of ideal for boys to live up to, and, not finding the existing scouting movements quite focussed enough, founded his own denomination of scouts to help with his work. Over the years, it became extraordinarily successful. Not only would these boys be taught the usual scouting things, but they would be taught their faith, given the sacraments that they lacked, and provided with a secure home-from-home where they could find affection and stability and some good food. The local social authorities and judiciary noticed the excellent work being done, and began to send boys to Riaumont for help. The trouble was that when these first boys grew up, they didn't want to leave. And so the religious community grew out of the scouts. 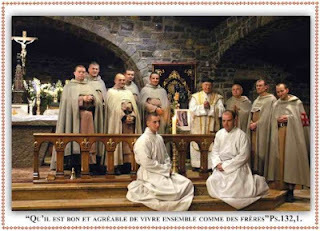 A man called something like Argouac'h (a Breton) was their first ordained priest, and now they have a trickle of young vocations continuing and expanding this remarkable work. Scouting remains at the heart of what they do—even the religious habit is khaki. So why is the Archdiocese of Paris so reluctant to support this excellent project? It's the old story: the community of Sainte-Croix de Riaumont celebrate the traditional Mass. Of course the Archdiocese don't say that, but they are absolutely adamant nonetheless that the bells shall not go to the community, but shall be melted down, and it seems hard to understand otherwise why. The manufacture of the little souvenir bells will cost some two million euros, apparently, without any prospect of buyers. Here they have a more than adequate offer which they are refusing. And now the bells have gone to law. For the Archdiocese, the difficulty is that, in French law, the bells aren't actually theirs. By a law of 1905, external features of ecclesiastical structures belong to the state, not to the Church. So, Fr Alain acted correctly in approaching not the Diocesan authorities, but the Direction Régionale des Affaires Culturelles d'Ile de France, known as DRAC, who verbally accepted his offer for the bells in October. This has been contested by the Diocese, and until the dispute can be settled, the bells have had a 'do not touch' order slapped on them by the state. And, as Fr Alain points out, a law of 15th July 2008 declares that anyone responsible for the destruction or even deterioration of historic religious objects faces seven years of imprisonment and a fine of 100.000 euros! p.s. There's an online petition here to save the bells. Until Mr Beeching had his wicked way, there was a railway line from Shoreham to Horsham, following the River Adur along much of its course: with a change at Christ's Hospital, you could travel on to Guildford, stopping at Bramley and Wonersh where our diocesan seminary is. How useful that would be to me today! Locals have told me that Beeching sent his ghouls out to inspect the traffic on the line during half term: the line was much used by school children, and it was these who principally suffered when the line closed. The timing of the inspection was considered to have been deliberate. Anyway, do enjoy these short movies showing the line in action—quite a bit filmed in colour. I'm not really a fan of the Jerusalem Bible, in either of its incarnations (that is, the original Jerusalem Bible of the early 1960s and the reworking under the remarkably energetic Dom Henry Wansborough* in the 1980s). That being said, I think that, as in so many historical matters, context is everything. Before the JB, in England and Wales there were really only two translations available to Catholics; the Douai-Rheims, which is so literal a translation (intended more for controversy, perhaps, than devotion) as to make it sometimes nearly incomprehensible; and the Knox version, produced in the 1940s, the work of one man. I very much appreciate Ronald Knox—I have two shelves of his books, (and am delighted to see that audible.co.uk has now issued his detective novels in unabridged audiobook form), but I can't warm to the Yoda-speak of his Bible translation: 'for the illumination greater of his auditors, backwards spoke he'. The JB was intended to be some sort of breath of fresh air, and seen against the context of the Douai and the Knox, who can doubt that that was what it was. It intended simply and artlessly (I suppose) to set down simply what the things seems to say, in modern language, deliberately avoiding translations of certain verses which have passed into the language such as 'in my Father's house there are many mansions', or even 'I know that my Redeemer lives/liveth', in order to give the reader a fresh experience of the Word of God. I'm not suggesting that the words can't mean that; apparently they can (though Fr Hunwicke would know best). But in cases like this I think a translator must ask himself not just what the words could possibly mean and then plump for the most unusual possible version just to give the passage 'freshness', but to ask himself what the author is actually saying. I do not think for a moment that the Evangelist is suggesting that God gives us grace in return for the grace we give Him (as if!). Charin anti charitos can also mean 'grace in exchange for grace', I am told, but surely it should be read 'grace upon grace' or 'grace after grace', and this indeed is just as accurate a way of rendering the Greek words, and a much more accurate way of rendering the theology. The translation of the famous bit of Job 'I know that my Redeemer lives' as 'I know that my avenger lives' makes that glorious passage unusable at a funeral unless one is lucky enough to have access to an RSV lectionary (and the old RSV lectionary is notoriously difficult to drive, let alone find). And what about that passage from John and Easter: 'I'm going fishing'; 'We'll come with you! '; Peter 'had practically nothing on'. And in the garden of Gethsemane: 'Who are you looking for?' I could go on and on. How about 'Jesus burst into tears' or 'and his hand was better'. Ouch, ouch, ouch! With our new Missal translation, these things seem more and more uncomfortable. I spoke about this with a very senior cleric, and he seemed to think it likely that a new edition of the lectionary might well use the RSV, which I presume means what is sometimes called the Ignatius RSV; the second Catholic edition, that is. He seemed to think that the proposal to use the NRSV has now been shelved: I heard some time ago that it had been planned to have lectionaries out by now in this version, but the delay was on the part of the NRSV people, who objected to the Catholic Church tinkering with God's Word by adding the little incipits before, for instance, the Gospel readings at Mass; things like 'at that time, Jesus said to his disciples………'. As an Anglican friend pointed out, this is all the stranger, as they seemed perfectly happy with the much more extensive rewritings of the text for the Anglican lectionary. But then perhaps it was that experience that led them to forbid any alterations at all for the Catholic lectionary. Anyway, we can be grateful that at least we have been spared the NRSV. I shall be very content if we can have the RSV, and hopefully soon! Note: Thanks to Joshua (see comments) for this link, confirming that we shall have an ESV lectionary soon. And thinking about it, I suspect that the bishop I was speaking to may well have said ESV, not RSV. But I think of ESV as being an improved RSV in any event—as long as important Catholic corrections are made, such as at the Angel's greeting; 'full of grace' rather than 'richly flavoured one' or whatever. * At the time I was working in Oxford, Dom Henry was the Master of St Benet's Hall. He was notable, among other things, for the fact that he sped around Oxford on roller blades; he had mastered the art of travel, but had not yet worked out how to stop, and was therefore obliged to grab onto something—a lamp-post, a college, a senior don, that sort of thing— if stopping became necessary. In this way, he passed into student legend, though, which is notoriously unreliable. The same corpus of legends, I am told, still tells of the way I used to go running in the University Parks in green lycra. I have never knowingly worn lycra in my life (unless woven into something else, I suppose), though I did have a green Irish rugby shirt which I sometimes used. Gaudete Sunday is always one I look forward to—there is appearing in a different colour, of course, but also a marker for the half way (or more) of Advent, and the prospect of the Rorate Mass. The only thing that spoils it for me is the second reading in the Jerusalem Bible version. I want you to be happy, always happy in the Lord. I repeat; what I want is your happiness. Let your tolerance be evident to everyone; The Lord is very near. A parishioner made reference to this recently, in criticism of the (extremely little) plainchant that we have introduced—in fact, only the Missal chants (and not the Gloria) in Advent and Lent. That, he said, is 'miserable', whereas the Bible says that the Lord wants us always to be happy; so why can't we have the 'clapping Gloria' all the time? Well it did no good to suggest that that that sort of thing was what made me miserable, or to point out that I have continually to sacrifice my taste so that he can have his—St Paul told us to be 'happy', and that is that. The question is, did he? 'Being happy' and 'rejoicing' seem to me to be two rather different things. St Paul's letter to the Philippians is a great hymn of Christian rejoicing as the answer to current suffering—rejoicing (like loving) is something we do rather than something we feel; the feeling comes as a consequence of the action. 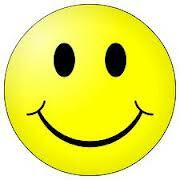 One can make oneself happy with all sorts of things, but rejoicing is something far more precious. And the reference to the nearness of the Lord rather has the sound of 'don't make a sound, because teacher's listening', rather than the confident hope of the coming Saviour (the thought comforting us in our tribulations) which suggests both the second coming and the approach of Christmas. We are the Easter people, and alleluia is our song. I have always rather thought that it is more appropriate to consider ourselves the Parousia people and Maranatha be our song. Which is why I much prefer the translation 'Rejoice in the Lord always; again I say rejoice! The Lord is at hand'. Will you share our joy? We're happy girls and boys.